The Oakland A’s and Seattle Mariners played a real, regular-season baseball game in Tokyo this morning, but it still had the whiff of an exhibition game. That’s probably due to the fact that it took place so far away and so long before MLB’s actual opening day, but it was also due to Ichiro Suzuki’s involvement. Ichrio will probably come in as a pinch-hitter and get an ovation, and that may be the last we’ll ever see of him as a player. 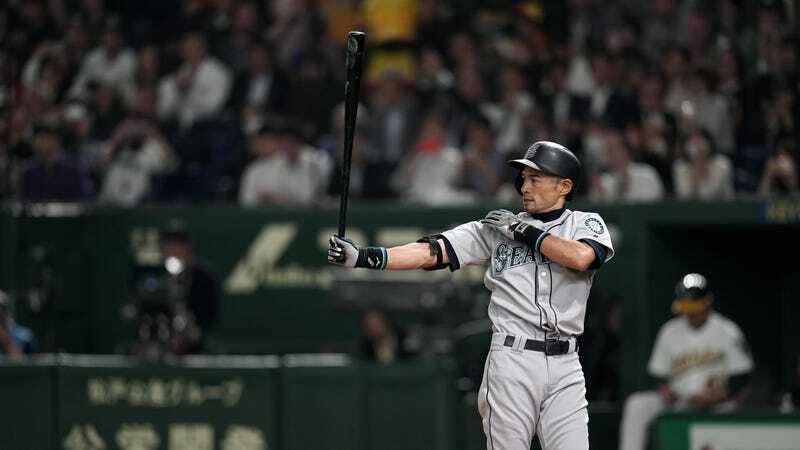 The Mariners were allowed to take three extra players to the series in Tokyo, but when they return to Seattle for their home opener they will have to trim the roster back down to 25 men, and it’s unlikely that there will be any room on the roster for Ichiro. It would be nice to see him take the field one more time and get a proper send-off in front of the Seattle fans who spent so many years cheering for him, but there’s no indication that will happen. Hell, they should give him a season-long retirement tour. He certainly deserves one just as much as Derek Jeter did.